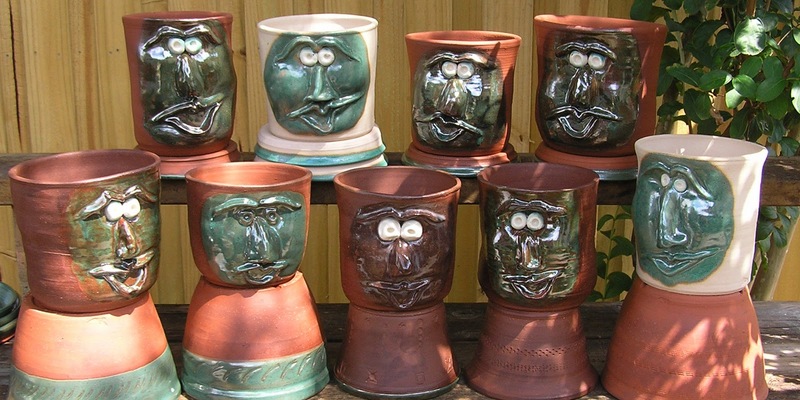 A couple of years ago, I explored making face jugs. My wife called them ogre jugs. "Think of Shrek and Jack Prelutsky's Ogre's Awful Day," she said. Jack Who? In any case, they made me laugh -- still do. But they were primitive, raw. Still, there was something about creating a human-like face. Shaping the skeletal structure -- the cheekbones, the brow bones, the noses, the ears -- was amazing. Watching the face jugs come to life and acquire personality? More than amazing. These past few months, I've been playing with a different kind of face, a face that emerges from the clay more than is the clay. The result? My Face Choir. A friend calls them my Pot Heads. In any case, they are planters; so think of them with plants growing from the tops of their heads. An ensemble group will be appearing with me this weekend at the Art Arbor Festival at Boyd Hill Nature Preserve (1101 Country Club Way S., 33705) in St. Petersburg. Stop by and say 'hi' to the guys. Wheelin' on the road -- this Saturday at Westfield Countryside Mall! An outdoor demo during the 2009 Studio Waltz. Potters, painters, weavers, and more from the Dunedin Fine Art Center are gathering at Westfield Countryside Mall on U.S. 19 in Clearwater this Saturday, August 27, from noon until 3 p.m. We'll be doing demos and spreading the word about all the good stuff the DFAC offers. Look for us on the upper level somewhere between Dillard's and Sears. You never know who's going to show up at a firing. 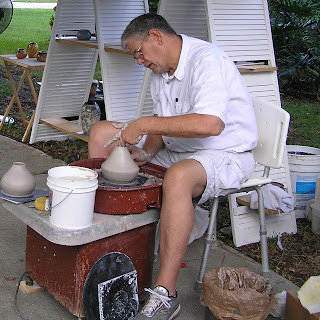 This past fall I participated in a workshop at St. Petersburg Clay Company where we were firing pots in one of the wood kilns. 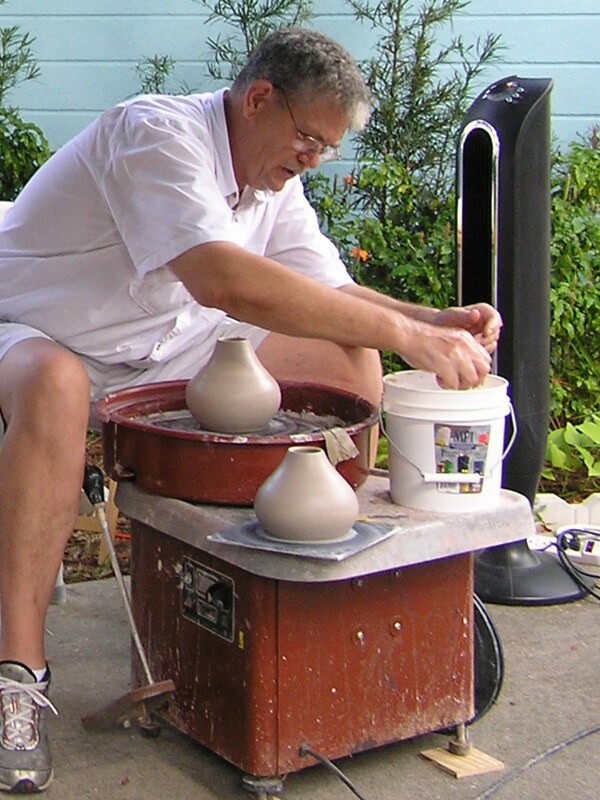 There wasn't quite enough room for all the work, so we stuck my pot in at an angle -- just to see what would happen. When my pot emerged from the kiln, most of the glaze had pooled near the bottom and, because of the angle, had collected in one droplet that never quite dripped from the pot. A few spots were totally barren of glaze. Ah well, it's all a learning process, I had thought as I examined the pot. I turned it this way and that. Suddenly, looking back at me when I held the pot upside down, was a face. The droplet, raised just enough from the surface of the pot, formed the nose and the bare spots evoked images of eyes and mouth. A bit like Edvard Munch's The Scream, but considering the pot had just come from the flames, also a bit apropos. Still, I wasn't sure I could balance the pot on its flared neck to display it. But my wife likes to create multiple pot displays. 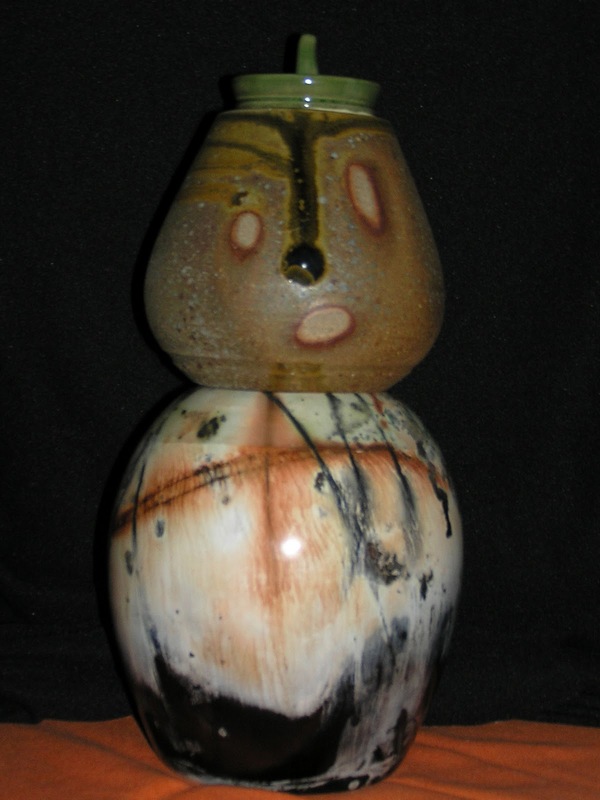 She found one of my first saggar-fired pots with an opening big enough for the neck of Mr. Munch-kin to rest in. A glazed ring-holder, one of many I had made for an upcoming show.